Cartoon depictions of Malaysia’s Petronas Twin Towers, Singapore’s Merlion, Thailand’s golden temples were among some of Southeast Asia’s landmarks gliding along on the screen behind the name ‘Sea Wander’. The mobile app with its brightly colored cartoon characters and educational games was unveiled and crowned as winner after the team responsible spent one month to build it for the UNESCO & Microsoft Hackathon for Culture and Peace on May 21, 2018. “I learned so many new things that I can take back and use in my work and even a new perspective for history,” said 18-year-old Yensira Chaisuk or "Shin", one of the five team members in NASHIMETEKO. "Everything in Asean comes from the same roots in so many aspects." 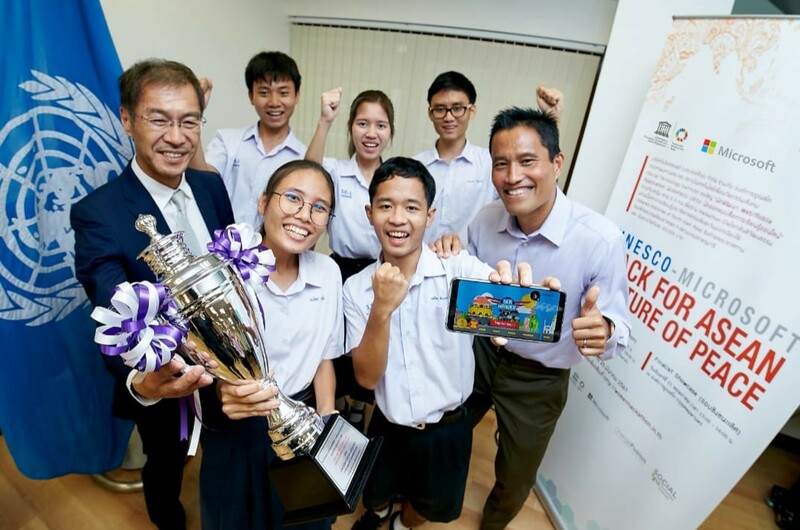 The NASHIMETEKO team, named after the first syllables of each of the five members’ names, walked off with 20,000 baht of prize money and a trophy from Her Royal Highness Princess Maha Chakri Sirindhorn. The five high school teammates are from the Rayong Wittayakom School in Rayong province, 3.5 hours away from Bangkok. They are about to enter their first years in their respective universities to continue their studies in science, engineering and the arts. The UNESCO & Microsoft Hackathon for Culture and Peace was organized as part of Microsoft’s efforts to encourage young women to enter the fields of science, technology, engineering and mathematics (STEM); today, only 30% of STEM graduates in Thailand are women. A requirement to compete in the hackathon included having at least mixed-gendered teams. "When I was a child, I loved to draw," said 17-year-old Nappasorn Sangkiew, another team member. "I started drawing on paper, then it went on to the Notebook Computer as digital painting, and then it evolved into designing logos and doing graphic animation." The Sea Wander app allows its players to choose between playing as a Bali farmer growing rice and a Cambodian silk maker. The game uses cultural folktale to help educate users on the history of rice and silk while plowing fields or feeding silk worms in mini-games in between storytelling narratives. "I myself am a mother of a five-year-old, which is why I want to know where I can download this app," said one of the judges, Montira Unakul, UNESCO Bangkok's Cultural program officer. "I think my son would want to play this game, and even many of the adults sitting in this room would want to play it too." The judges on the panel were allowed two votes each as their final choices. NACHIMETEKO was picked by all five judges, resulting in a unanimous decision to declare them the winner. Other teams had developed applications that implemented augmented reality questionnaires, story-based time travel and even an educational journey on spice routes. The promotion of national identities, with neighboring countries portrayed as opponents, is rooted in history curriculums among the 11 countries in Southeast Asia, according to historians. The hostile depictions influenced generations of people's mindsets to view neighboring nations as enemies. The Shared Histories project is aimed at providing new un-biased views of history and proposes new ways of teaching it while emphasizing similarities between nations to cultivate respect. "We believe that education is very important," said Desarack Teso, the Director of corporate, external and legal affairs for Microsoft and one of the judges. "The job of today may not exist tomorrow, and the job of tomorrow may not exist today, so you don't really know the skills that you need to compete in your future." The Sea Wander app with its kid-friendly graphics, clear subtitles, upbeat tunes and smooth gameplay was lauded as an outstanding example of intersection between technology and learning by Teso. It reflects Microsoft's belief that "technology, no matter how advanced, is meant to serve and enhance the capability of humanity," he said. The hackathon is in line with Microsoft's goal to help people attain the digital skills and knowledge needed to succeed in the digital economy and become "future-ready", free of technological obstacles, biased thinking and outdated norms – especially for women.